Vermont Stone Art is excited to announce the recent release of our new sample books! The books feature a cover photo from one of our projects in which VSA supplied the limestone and marble that built the Storr Library at Middlebury College. Inside you will find a wide range of the granite and limestone products that VSA has become known for. Each book contains 18 different samples that range from a full array of New England stones as well as some our standard product lines such as the ‘VSA Olympic Series’. We also display some of our more exotic stone types such as VSA Eramosa and VSA Crème Regina. No matter what type of stone design you have in mind, our sample books are sure to help point you in the right direction with ‘Architectural Stone That Fits’! If you are interested in obtaining a sample book to help with your next project please contact our office at 802-264-1075 or email us at info@vermontstoneart.com. If you would like to speak with a member of our highly trained architectural sales team to obtain more knowledge of the products and services we offer, feel free to email Jon Singleton at jsingleton@vermontstoneart.com. Previous post: VSA Featured in Slippery Rock Gazette! 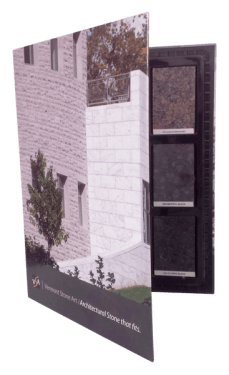 Next post: Case Study – Colored stone material for cladding a building?